I've decided I want to start reading more of the classics. I love reading in general, but I've not read much of the iconic works of the literary stalwarts. Take Jane Austen for instance. I love her stories, but I've only ever read one of her books - Pride and Prejudice. And Charles Dickens? I've read Great Expectations, but only because it was part of my year 12 curriculum, and if my memory serves me correctly, I only actually read half of it before turning to the Cliff's Notes for a summary! Why do I want to read them? These stories have stood the test of time. Many of their themes are as relevant today as when they were written, and if they're not, they at least give us an insight into the thinking of the day. Every week, or even daily I'm sure, new novels are published, yet they flit in and off the shelves in an instant. You'll always find the classics in any book store in the world. So with this thought in mind, I popped into the book store at Sydney Airport whilst waiting for my flight, and picked up a copy of J.D. Salinger's Catcher in the Rye. I didn't know anything about this book, nor the controversy that surrounded it when it was published in 1951. Having read it though, I can see why - whilst the subject matter, language and behaviour of the character wouldn't cause an eyelash to batter these days, it was pretty in your face for its time. Profanity, sexual references, blasphemy...it's got it all...imagine how that went down in 1950's America?! 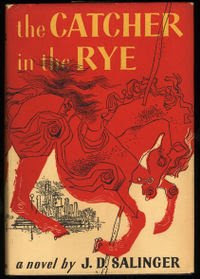 Catcher in the Rye is essentially a first person overview of the life of a 16 year old boy, Holden Caulfield, on the brink of depression. It's set in late 1940's New York and recounts the 48 hours immediately after Holden's expulsion from boarding school - his experiences, his emotions, his though patterns, his opinions. Despite the novel's worldwide popularity over the past 50 years, there has never been a film adaptation of it, not due to lack of interest, but rather the author's refusal to grant anyone the rights. Throughout the book though, I kept picturing Leonardo Di Caprio in the lead role and Abigail Breslin (Little Miss Sunshine) playing Holden's baby sister. So that's one classic down and hundreds to go! Any recommendations on which one I should tackle next? I'm embarrassed to admit that I haven't read any major classics either. I read a couple of stories for my American Literature class in college but that's about it. I tend to read contemporary novels and magazine articles. Am currently reading Eat, Pray, Love by Elizabeth Gilbert. Read Vroom with a View by Peter Moore last summer per your suggestion. That was a great book. Hi girl! I would recommend "Tess of the D'bervilles" (not sure if I spelt that last word correctly). I remember in year 11 being given two pages of the book to read, interpret and write on. It was soooo hard to me then - I took it home and my mom helped me with it - it took forever. Then we were handed the entire book - I cried, literally sobbed into my mother's arms. She bought a copy and read it along with me. Then 5 years later when living in China I bought another copy and decided to have another "mature" go at it - loved it!